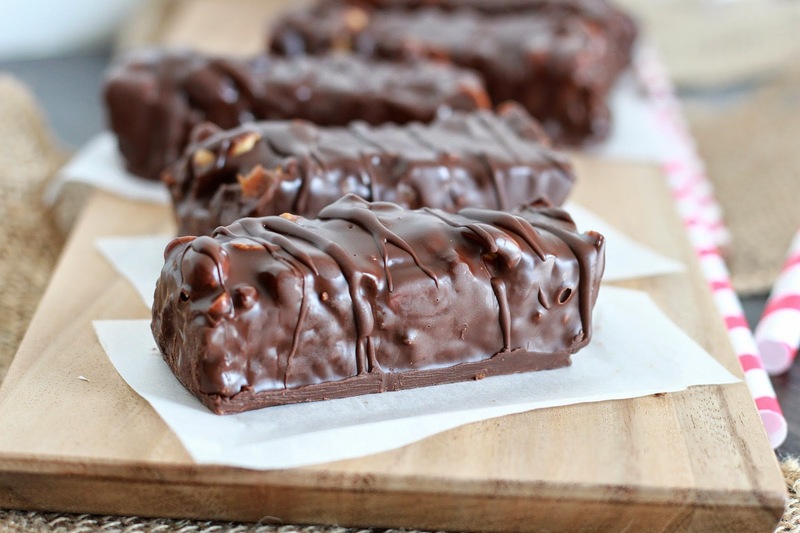 When it comes to chocolate -- anything goes. I love dark chocolate -- the darkest of the dark. Well, not 100% cocoa. Up to 85% and I am in heaven. But I am not necessarily a purist, either. I think that's pretty clear from my blog. Sugar cookies to healthy cookies to protein cookies. Cupcakes with buttercream or with healthy paleo frosting. No purist, here, nope! 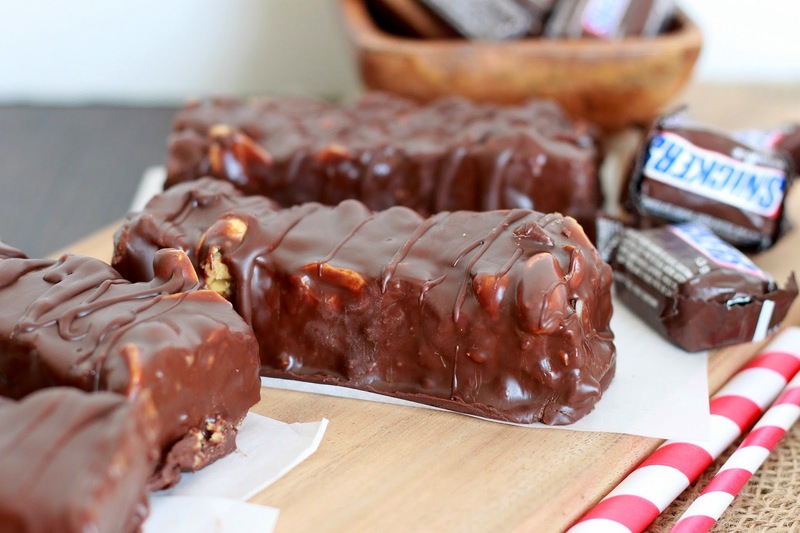 When it comes to candy bars, however, I definitely have my preferences. I am a caramel lover. A nut lover. A chocolate lover. 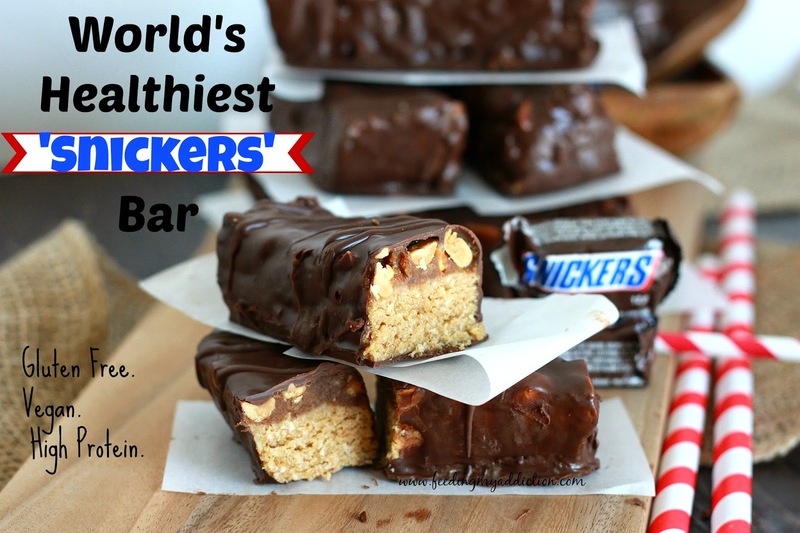 So snickers, naturally, ranks pretty high for me. 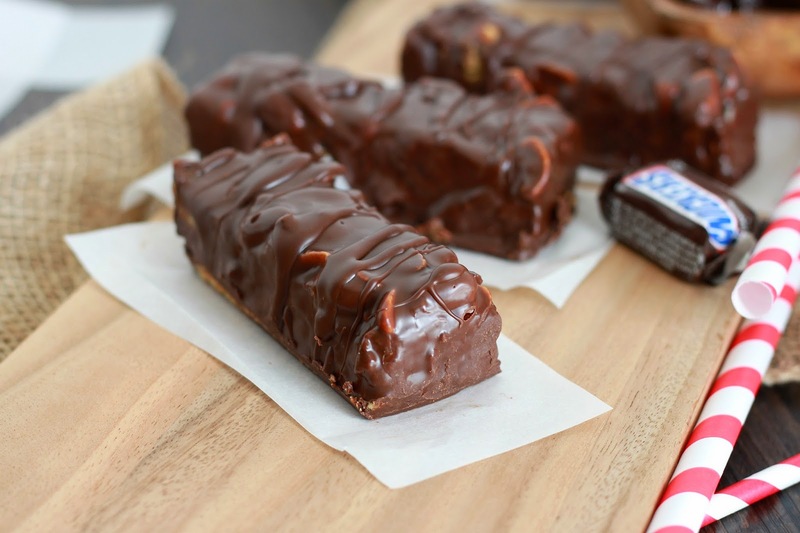 And unlike the ordinary version these really can satisfy your hunger because THESE are packed with vegan protein! Oh and raw vegan caramel. My family more or less lost their minds. Everyone loved these -- my mom, brothers, Uncle, Aunt, GRANDMA. Yes. 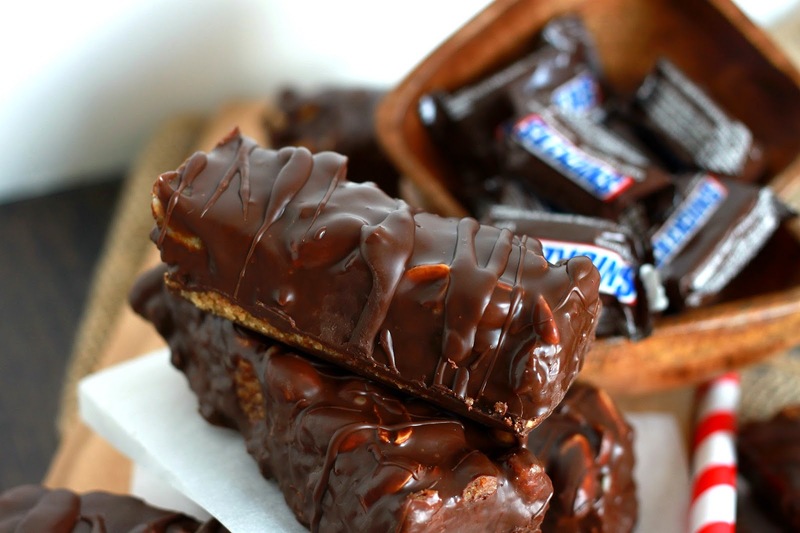 My grandma approved these healthy home made snickers bars, as well. And she doesn't give her seal of approval to just anything, you know! She's old school and we are Arab. So that means no eating out or consuming outside food of any sort really. Why? Because she is an amazing cook! So she only reserves her seal of approval for top notch things. 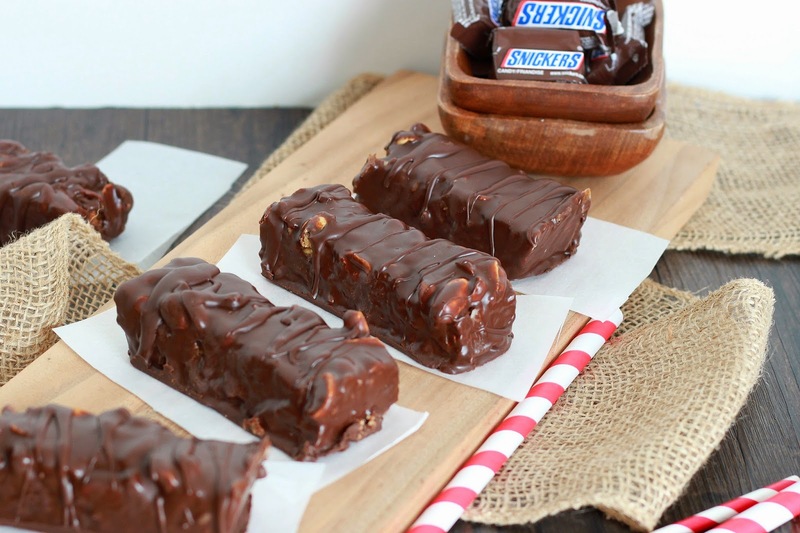 My Uncle and her agree to call this a candy bar would be an insult. 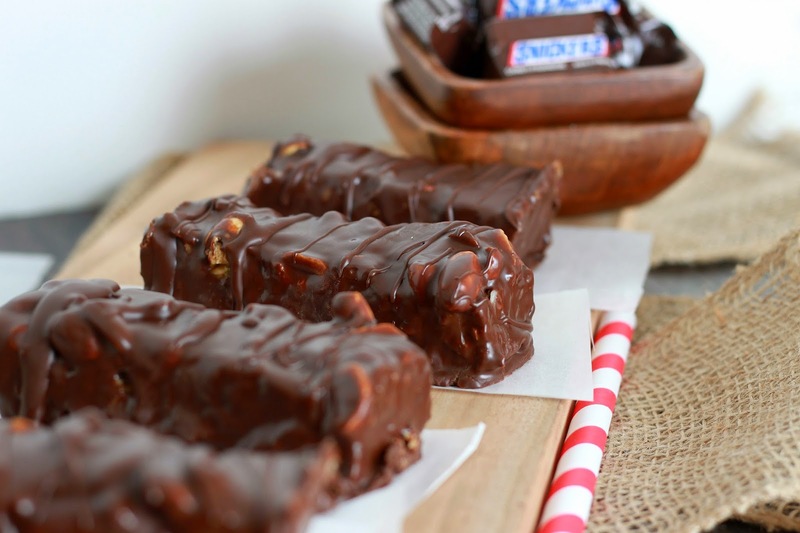 It's a classy healthy snickers bar full of yummy delicious things that are amazing for you. But most importantly these are SO FREAKING DELICIOUS! 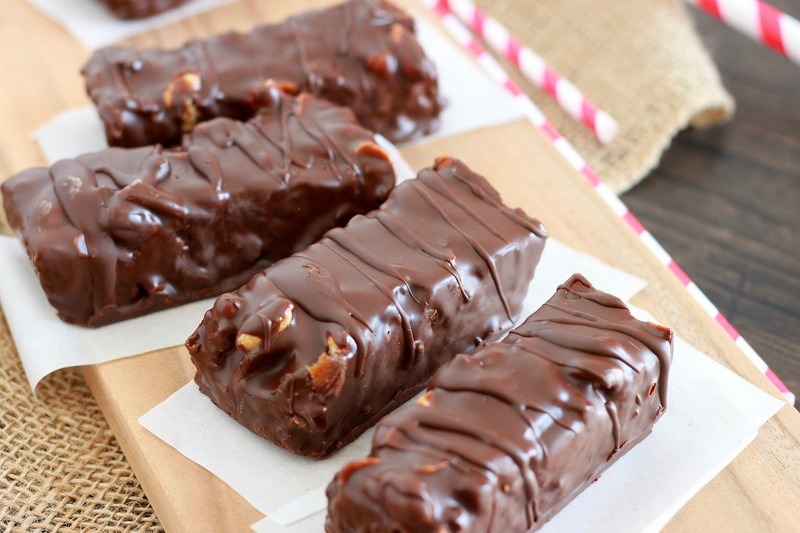 Chewy, crunchy from the peanuts, smooth and sweet from the caramel -- and ahhh that chocolate! Look how shiny and luxurious it is! It's just like Ooooo ahhhh look at my. Check out that middle! JUST LIKE THE REAL THING! 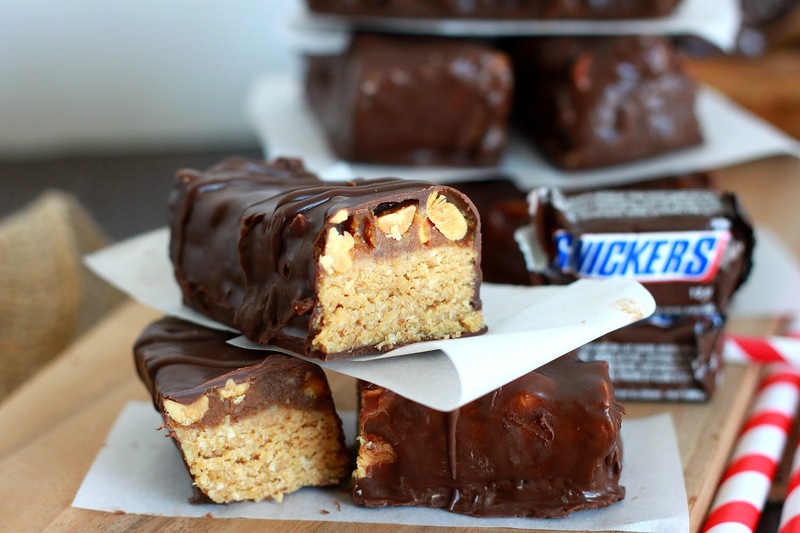 Those are mini snickers in the picture just to highlight how giant these are. They were so big I just remember thinking. Wow. I could never eat this whole thing. Better just have half! Then I remember sneaking back downstairs to steal the other half anyways. Whoops? I know I have a lot of different protein bars. But take my word for it -- these are EVERYONE'S favourite so far. They have a lot going for them flavour-wise but also texturally. Ohhh the texture. Smooth and silky and crunchy and chewy and ahhh. So good. I know these take a bit more work than buying discounted candy bars at the gas station but MAN is it worth it. Once bars are completely set cut them into as many bars as you'd like -- I made 10 very large bars -- you can choose less or more! Enjoy! Store left over bars in the fridge. And dippity-do you have Snickers, too! Or dippity-don't! 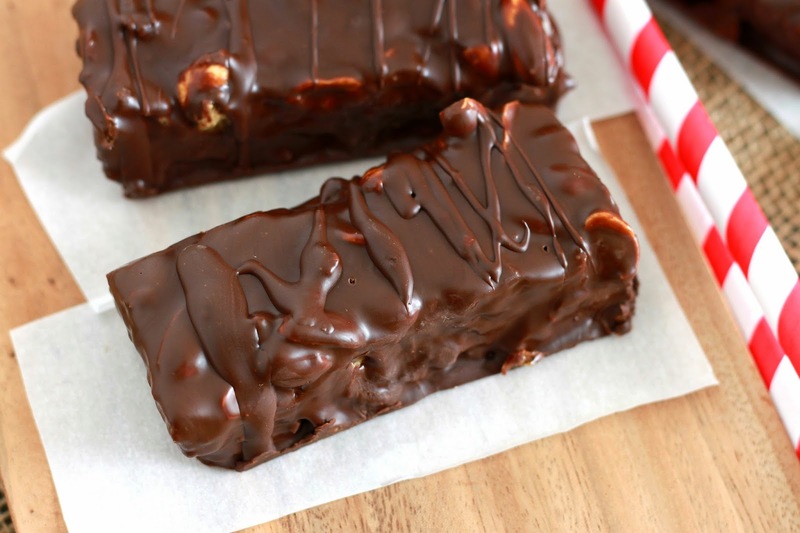 You could always leave these in the pan, pour chocolate on top like my usual protein bars and then cut them into 16 squares! Sometimes eating things in different shapes is just fun! Plus I wanted to be authentic to the name and make it into a 'bar' but you can do whateverrrr you like. 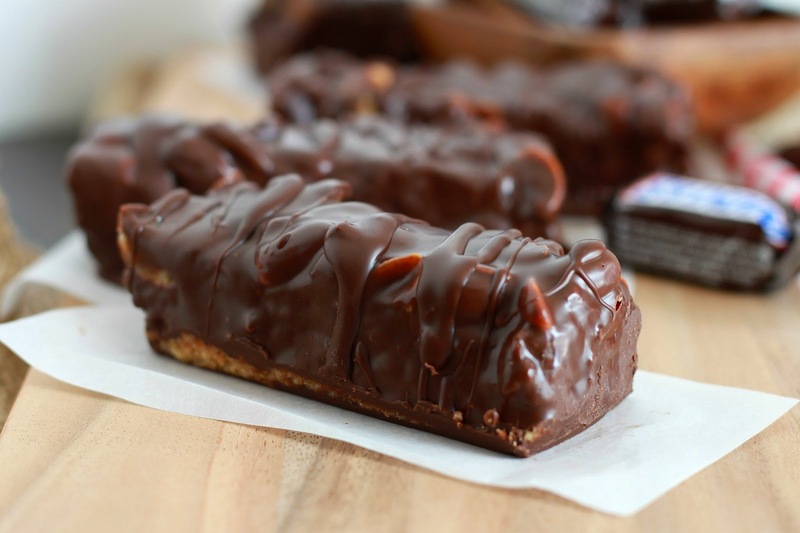 I poured the leftover chocolate over top in drizzle-like formations. These keep well at room temperature for quite a while. They don't really NEED to be in the fridge as there is no dairy or perishable ingredients in them but I like them cold from the fridge and they stay longer that way. Big. Chocolatey. Pea-nutty. Caramel-y. 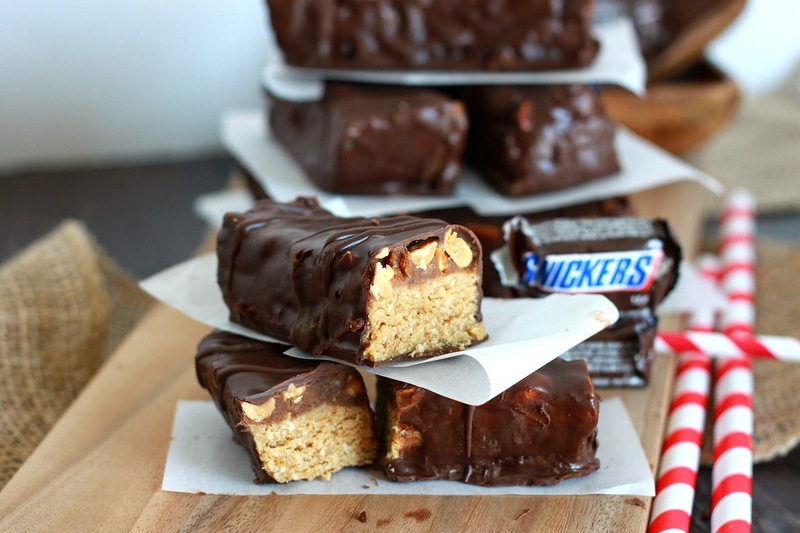 All the best things a candy bar should be. 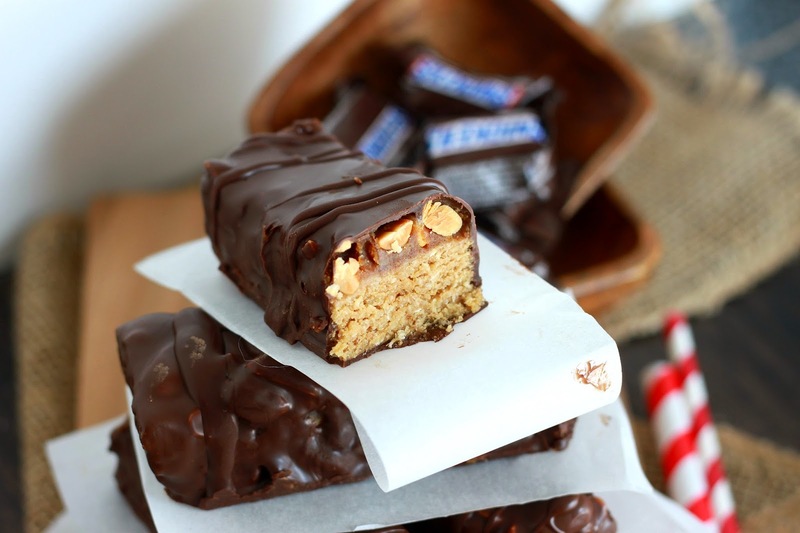 It got be thinking about what OTHER candy bars I should be healthifying. 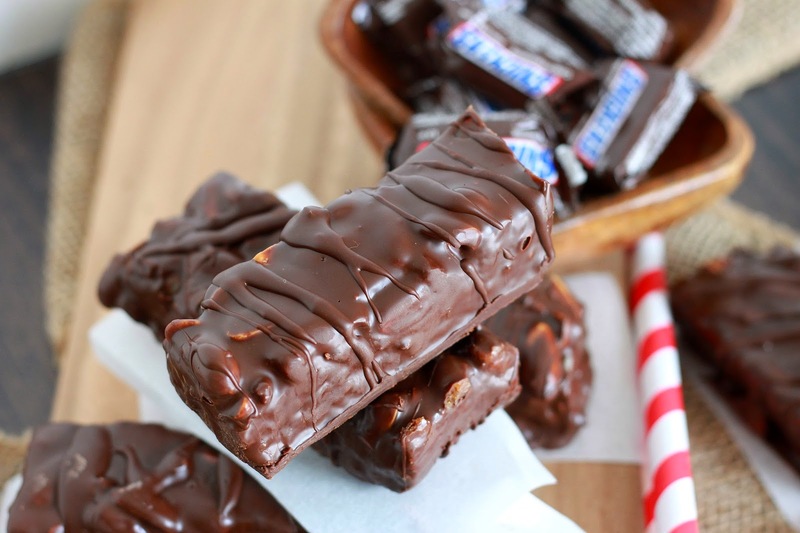 Maybe Bounty bars?!? I love me some coconut. Do they have Bounty bars elsewhere?! I never know what's selective to Canada until I go elsewhere. Like the States. YOU'RE SMARTIES ARE OUR ROCKETS. GROSSSSS.... I hate those things! But I do love Smarties. Which to us are like M&Ms but in my mind are different enough to warrant taking sides. It's like Pepsi & Coke. I never drink pop. Maybe once a year at most. But I am team Coca-Cola allll the way! I don't know why, I just think it's better. And I am old and wise enough to realize that could all be in my head! 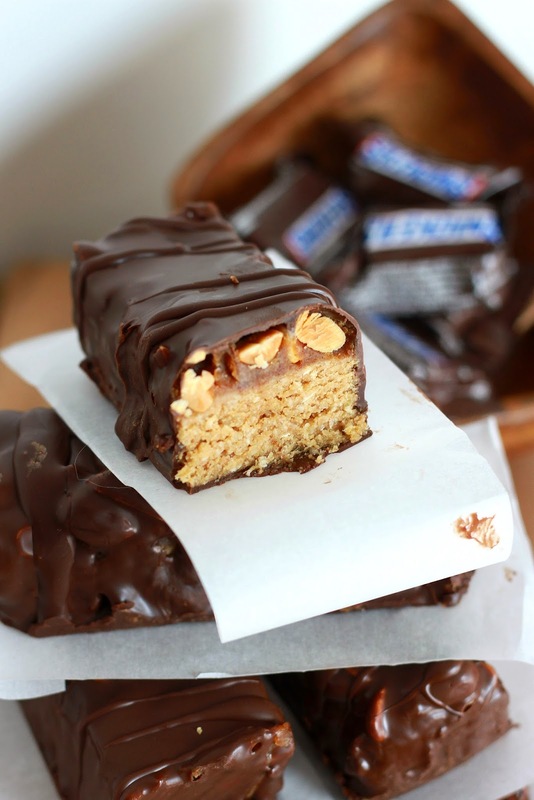 What candy bar should I re-create next!??! Help! Also to those who have signed up for my newsletter -- THANK YOU! I will be sending the first Feeding My Foodies letter out SOON so stay tune! I use the Fat burner supplements twice. Thanks a lot from this ! !